“I think out of all the years of doing this [music], this experience is the top two or three highlights without a doubt. It’s something that none of us are going to forgot,” explains Myles Kennedy in a recently released trailer that can be seen below. 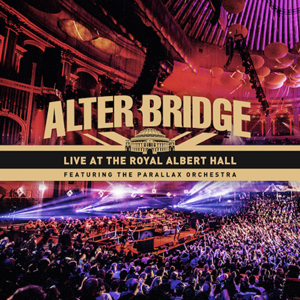 Live At The Royal Albert Hall is a 21-song collection that features some of ALTER BRIDGE’s biggest hits, fan favorites and even a couple of rarities including “Words Darker Than Their Wings” – a song the band had never played live previously. Songs like “Before Tomorrow Comes”, “Ghost Of Days Gone By”, “The Last Hero” and “Broken Wings” all find new life with the unique arrangements presented by Dobson and the Parallax Orchestra performing alongside the band. The pre-order for the release is live and fans can order various audio and video configurations including Blu-Ray, DVD, CD and Vinyl as well as other unique bundles with exclusive content. The pre-order is currently live here: http://smarturl.it/LiveFromTRAH and at www.alterbridge.com. A portion of the proceeds from all sales will go to the Future Song Foundation; an organization that Myles Kennedy is closely involved with. The first track released from the collection is the band’s chart-topping single “Addicted To Pain” The video for that song can be seen on KNAC.COM HERE. "Words Darker Than Their Wings"